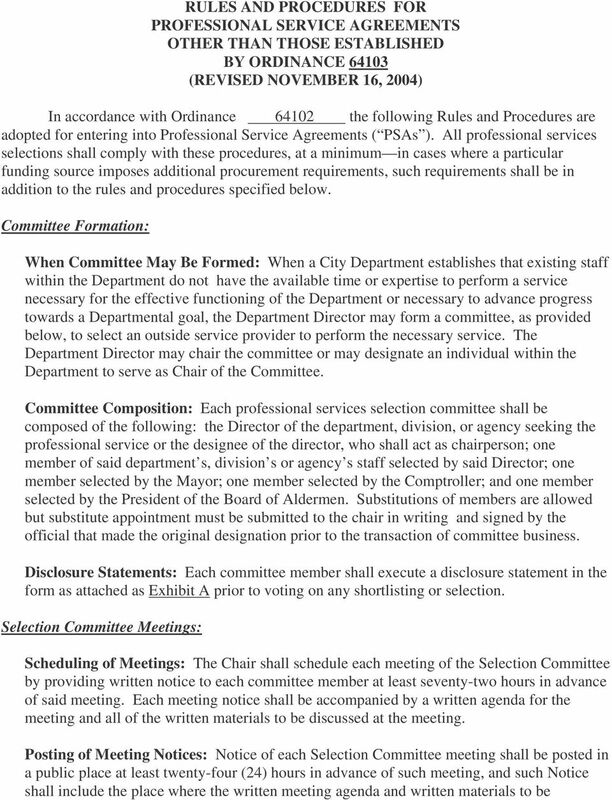 Download "RULES AND PROCEDURES FOR PROFESSIONAL SERVICE AGREEMENTS OTHER THAN THOSE ESTABLISHED BY ORDINANCE 64103 (REVISED NOVEMBER 16, 2004)"
3 The Chair shall prepare and distribute minutes of each selection committee meeting with meeting notices for the next subsequent meeting, for approval by the committee at its next subsequent meeting. The minutes of the last meeting of the committee for a particular selection shall be distributed to committee members by mail. If any committee member objects to the contents of the minutes, the Chair shall revise such minutes to either correct the content objected to or to record the objection to the content if there is disagreement as to which version of the content is correct. 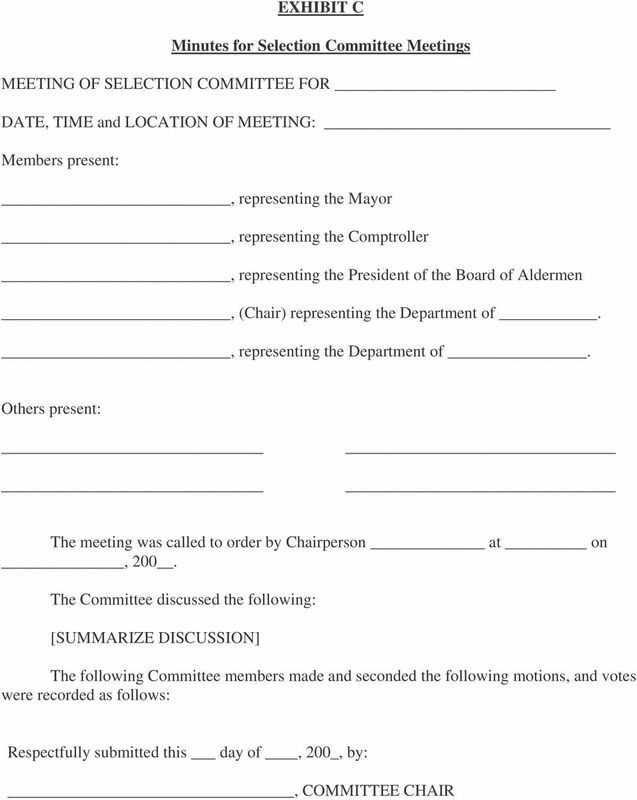 In the case of the minutes of the last meeting, the Chair shall distribute any corrected minutes by mail to each committee member. 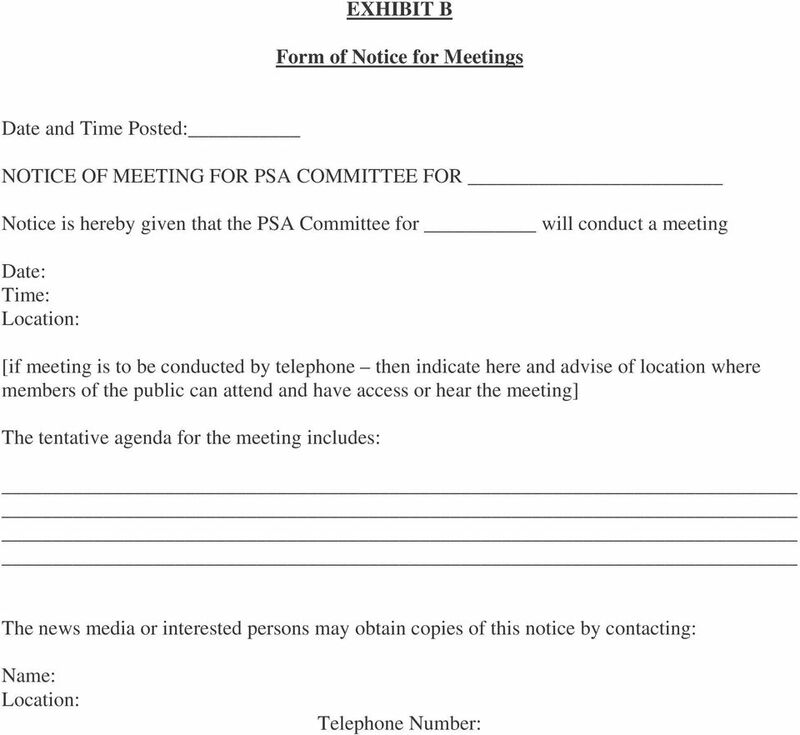 The form of minutes for each meeting shall be used substantially as attached hereto as Exhibit C. The Chair shall maintain a file of documents related to the selection proceedings. Such file shall include the following, which shall be retained in accordance with Missouri Law: Copies of all Selection Committee appointment documentation. Copies of all meeting notices. Copies of all meeting agendas. Copies of all correspondence related to the selection. Copies of all written materials distributed to Committee members. Copies of draft and final Requests for Proposals. Copies of all responses submitted in response to the RFP. Copies of any other materials submitted by respondents or others with respect to the selection. 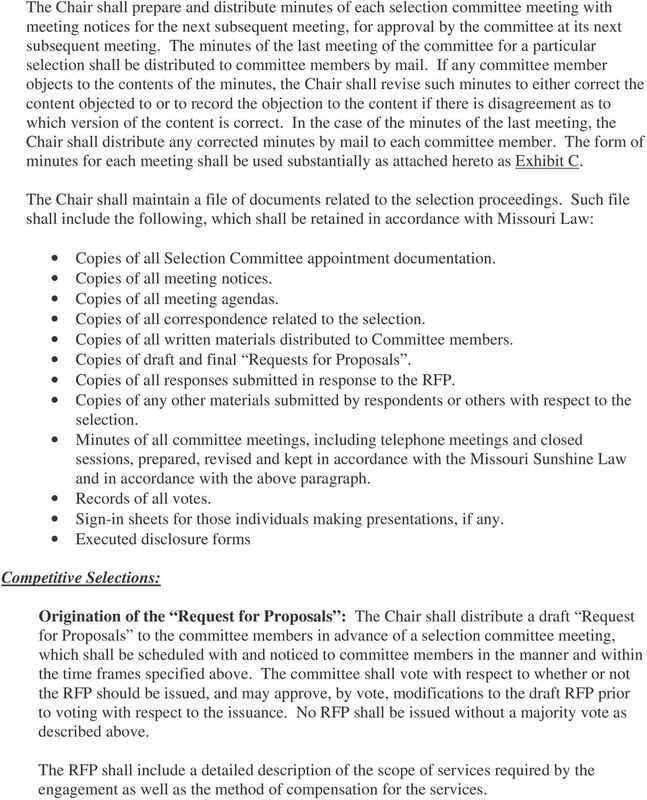 Minutes of all committee meetings, including telephone meetings and closed sessions, prepared, revised and kept in accordance with the Missouri Sunshine Law and in accordance with the above paragraph. Records of all votes. Sign-in sheets for those individuals making presentations, if any. 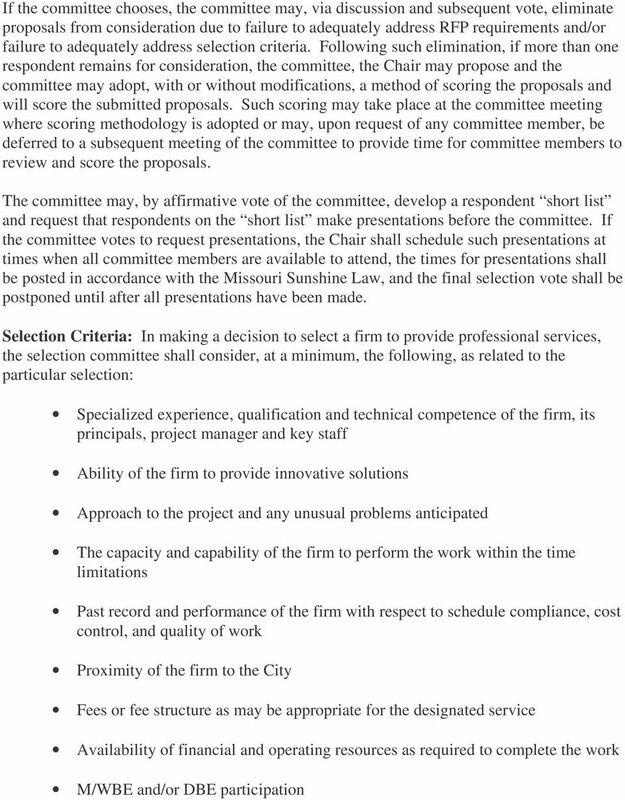 Executed disclosure forms Competitive Selections: Origination of the Request for Proposals : The Chair shall distribute a draft Request for Proposals to the committee members in advance of a selection committee meeting, which shall be scheduled with and noticed to committee members in the manner and within the time frames specified above. The committee shall vote with respect to whether or not the RFP should be issued, and may approve, by vote, modifications to the draft RFP prior to voting with respect to the issuance. No RFP shall be issued without a majority vote as described above. The RFP shall include a detailed description of the scope of services required by the engagement as well as the method of compensation for the services. 4 The Chair shall present the committee with a recommended proposal solicitation method, which may include advertisements in newspapers, City Journal, and other publications, mailings to professional list or registers, advertising upon the internet, and/or by written invitation to specific prospective respondents, which shall be named in the Chair s recommendation if such method is recommended. 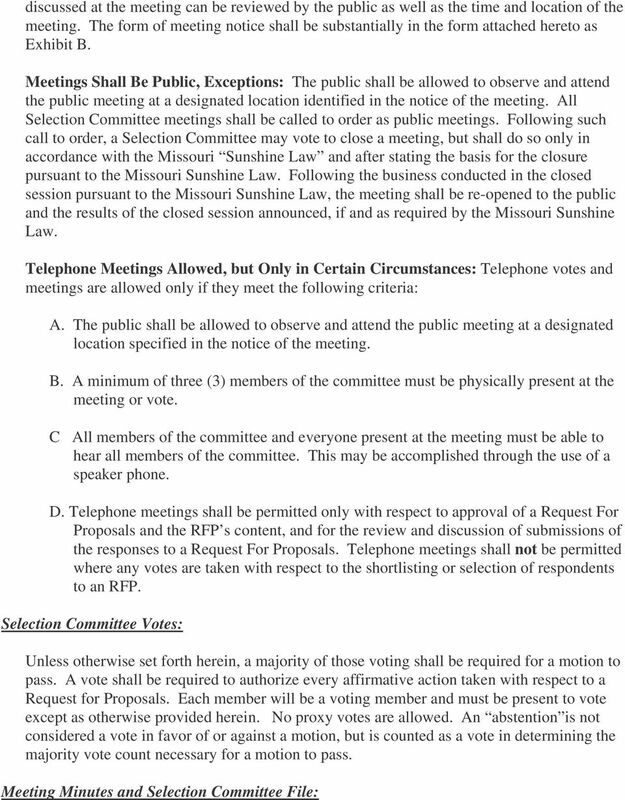 The committee shall vote with respect to the proposal solicitation method, and may approve, by vote, modifications to the Chair s recommended proposal, prior to voting with respect to the solicitation method. 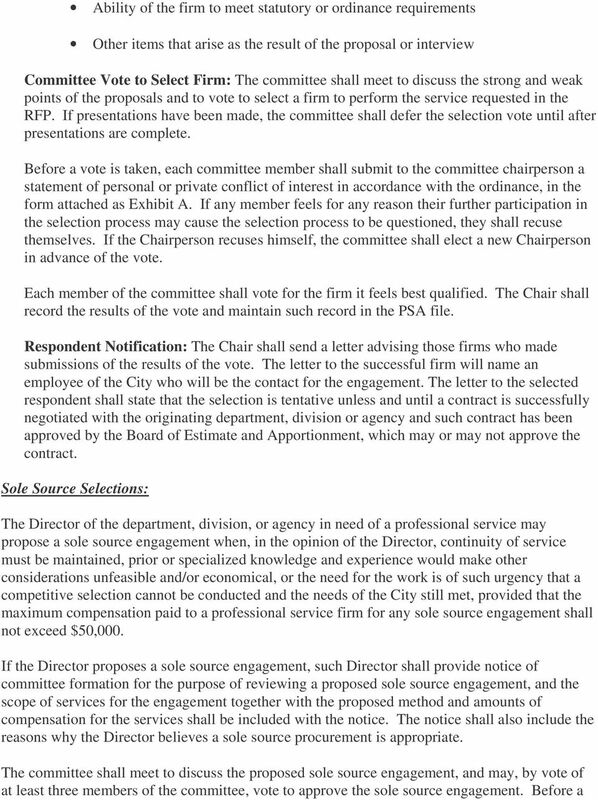 No RFP shall be issued without a majority vote on the proposal solicitation method as described above. All Requests For Proposals will state the time and place the responses will be received as well as the composition of the selection committee. The RFP shall state the name of the designated committee contact person, and shall further state that no contact with any other committee members is permitted. The RFP shall further state that all contacts and questions must be submitted in writing to the designated contact person and that the contact person will respond in writing to each contact and/or question. The RFP shall also include a time, no earlier than seven days prior to the date the responses are due, by which all questions must be submitted. The RFP shall further state that the Department shall maintain a list of all entities requesting copies of the Request for Proposals and shall ensure that copies of all questions and responses thereto shall be made available to each entity on such list. Each RFP shall also state the selection criteria to be used by the committee in evaluating responses to the RFP and the required schedule for completion of the work, if the respondent is selected. All RFPs shall require the submission of an original and a minimum of five (5) complete copies of each response, so that each committee member may receive a full and complete copy of each proposal. Review of Responses: The Chair shall be responsible for receiving and recording all submissions of proposals in response to the RFP. The Chair shall distribute complete copies of each proposal to each committee member at least seventy-two (72) hours in advance of any selection committee meeting scheduled to review and discuss the proposals. 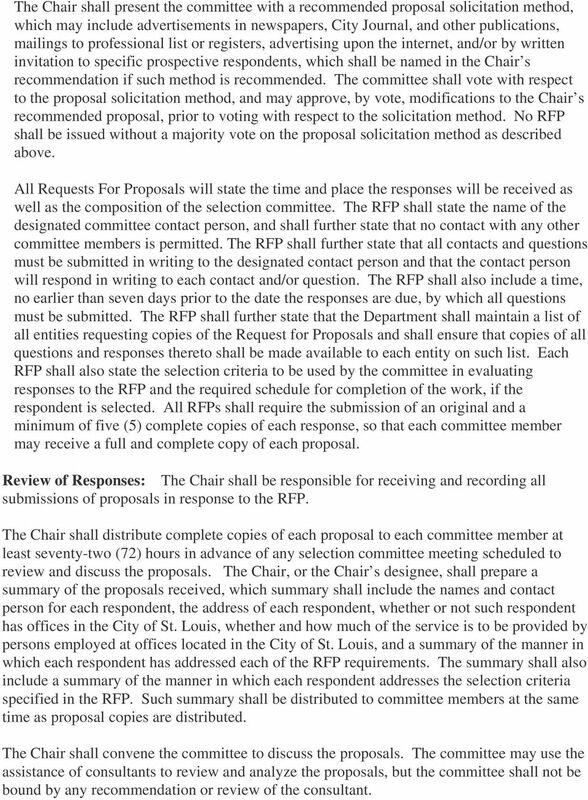 The Chair, or the Chair s designee, shall prepare a summary of the proposals received, which summary shall include the names and contact person for each respondent, the address of each respondent, whether or not such respondent has offices in the City of St. Louis, whether and how much of the service is to be provided by persons employed at offices located in the City of St. Louis, and a summary of the manner in which each respondent has addressed each of the RFP requirements. The summary shall also include a summary of the manner in which each respondent addresses the selection criteria specified in the RFP. Such summary shall be distributed to committee members at the same time as proposal copies are distributed. The Chair shall convene the committee to discuss the proposals. The committee may use the assistance of consultants to review and analyze the proposals, but the committee shall not be bound by any recommendation or review of the consultant. 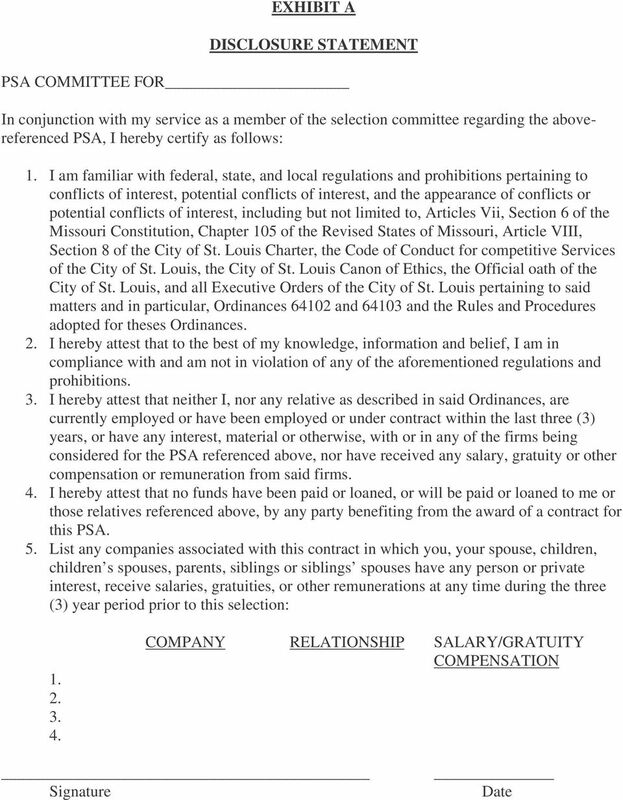 7 vote is taken, each committee member shall submit to the committee chairperson a statement of personal or private conflict of interest in accordance with the ordinance, in the form attached as Exhibit A. If any member feels for any reason their further participation in the selection process may cause the selection process to be questioned, they shall recuse themselves. 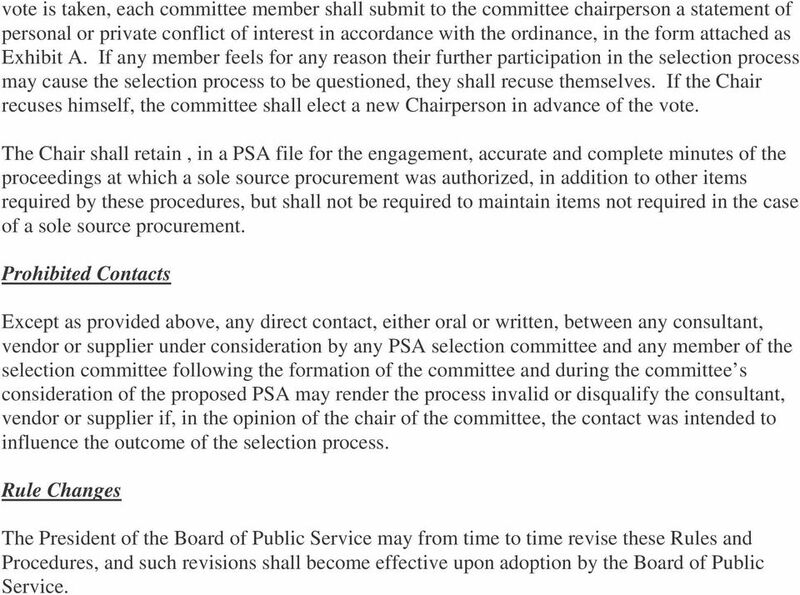 If the Chair recuses himself, the committee shall elect a new Chairperson in advance of the vote. The Chair shall retain, in a PSA file for the engagement, accurate and complete minutes of the proceedings at which a sole source procurement was authorized, in addition to other items required by these procedures, but shall not be required to maintain items not required in the case of a sole source procurement. Prohibited Contacts Except as provided above, any direct contact, either oral or written, between any consultant, vendor or supplier under consideration by any PSA selection committee and any member of the selection committee following the formation of the committee and during the committee s consideration of the proposed PSA may render the process invalid or disqualify the consultant, vendor or supplier if, in the opinion of the chair of the committee, the contact was intended to influence the outcome of the selection process. Rule Changes The President of the Board of Public Service may from time to time revise these Rules and Procedures, and such revisions shall become effective upon adoption by the Board of Public Service. RULE 3. All Members not subject to Limitation shall have an equal right to be represented at a General Meeting.